Welcome to Princeton Allergy and Asthma Associates. From research to prevention, education to the latest treatment options, our physicians at Princeton Allergy & Asthma Associates help patients of all ages breathe easier and feel better season after season. It's among the many reasons Princeton Allergy & Asthma Associates has earned the distinction of being the area's premier allergy and asthma group. 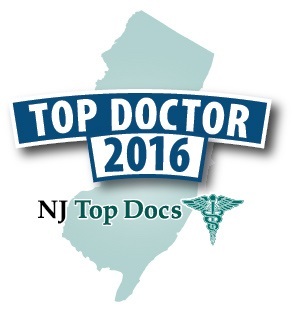 Our physicians are listed in Castle Connolly's Top Docs as well as NJ Top Docs. At Princeton Allergy & Asthma Associates, we pride ourselves on taking the time to get to know our patients and working with them to understand their lifestyles and the environments in which they live and work. This enables us to provide more informed diagnoses, better identify potential allergens or asthma triggers, and develop the most effective treatment and management plans. We also work with most insurance and managed care companies, making it easy for patients requiring referrals. Our staff places special emphasis on patient education. We help our patients understand how they can better manage their own care -- whether by making more informed choices, using asthma devices correctly or by learning to avoid or eliminate triggers and allergens that cause symptoms. We also take the time to explain things to our patients on a personal level, giving them a high level of comfort and confidence. Our physicians at Princeton Allergy & Asthma Associates are well respected among peers and primary care physicians alike because of their professionalism, responsiveness and practice of evidence-based medicine -- which means delivering the highest levels of patient care based on the most current medical literature and international consensus. It's no surprise that the children of most of the area's physicians who require allergy and asthma care are referred to us. Our physicians also make themselves readily available to referring physicians. They will gladly consult on specific cases or answer questions as needed. Awarded Intern of the year. Awarded Resident of the year. Dr. Caucino completed her fellowship training in Allergy, Asthma and Immunology at Albert Einstein and Montefiore Medical Center in New York City. Following her Fellowship she remained as an associate professor in the department of Allergy, Asthma and Immunology and part time in private practice in Princeton New Jersey. After finishing her National Institute of Health obligations she entered a full time position at Princeton Allergy, Asthma and Immunology. Initially she was active with the Internal Medicine residents as a clinical instructor. Dr Caucino is currently the associate medical director at Princeton Clinical research where she actively participates in clinical trials involving the newest therapies for asthma and allergy. 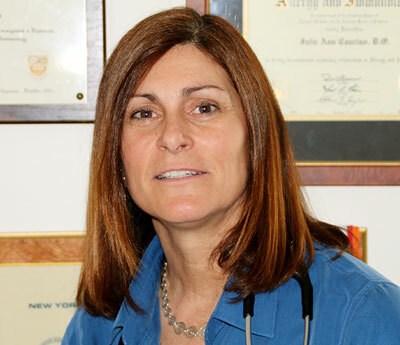 Dr. Caucino has been a TOP doctor in New York METRO area Castle Connolly Medical Ltd. for the many years. Her areas of expertise include comprehensive care in asthma, allergy, sinusitis, contact dermatitis, bee sting allergy, anaphylaxis and drug allergies. 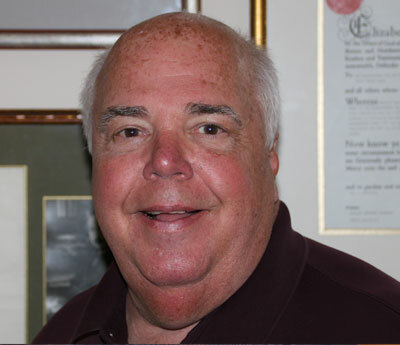 Andrew Pedinoff has been practicing allergy and asthma in the Princeton area for over 25 years. He completed his Allergy and Asthma Fellowship at Georgetown University. He is board certified and a Fellow of both the American Academy of Allergy, Asthma and Immunology and the American College of Allergy, Asthma and Immunology. He is the Section Chief of Allergy at University Medical Center of Princeton at Plainsboro. 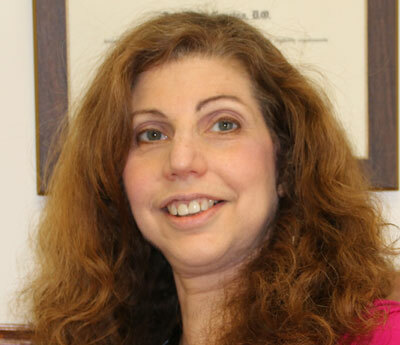 Dr. Pedinoff is also the Medical Director of Princeton Center for Clinical Research. He has conducted clinical research for 30 years and has completed over 750 clinical trials. He is the author of many published articles in both asthma and allergic rhinitis. He conducts research to help advance treatment of respiratory disease. Dr Pedinoff has been a TOP doctor in New York METRO area Castle Connolly Medical Ltd. for the last 15 years. Dr Pedinoff emphasizes prevention of allergy symptoms through identification of triggers, patient education and the use of preventative medications. Dr. Kristen Sikorski completed her fellowship training in Allergy, Asthma & Immunology at Strong Memorial Hospital at the University of Rochester. Following her fellowship she joined Princeton Allergy & Asthma Associates. Dr. Sikorski actively participates in clinical trials involving the newest therapies for asthma and allergy. She treats a spectrum of allergic and immunological conditions including angioedema, urticaria, allergic rhinitis, food allergies and asthma. 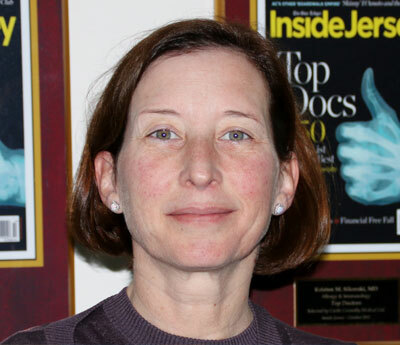 Dr. Sikorski has a special interest in allergic contact dermatitis. She offers comprehensive Patch Testing and extensive education to patients with this form of skin allergy. Dr. Southern is especially interested in the management of asthma in both pediatric and adult patients. Dr Southern actively participates in clinical trials involving the newest therapies for asthma and allergy. He treats a spectrum of allergic and immunological conditions including angioedema, urticaria, allergic rhinitis, food allergies and asthma. 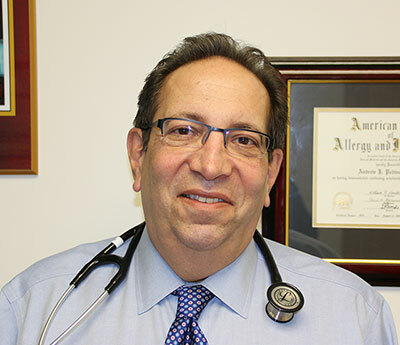 Dr. Skolnick has been trained to care for a wide array of allergic diseases. After training in pediatrics at New England Medical Center, she attended a pediatric Allergy and Immunology fellowship program at Johns Hopkins Hospital and has been cross-trained in adult allergy and immunology. She treats a spectrum of allergic and immunological conditions including angioedema, urticaria, allergic rhinitis, food allergies and asthma. Dr. Skolnick specializes in food allergy and has conducted research in this field. She regularly conducts food challenges in the Princeton office. Food challenges aid in the diagnosis of food allergy as well as help determine whether a child has "outgrown" his/her food allergy. 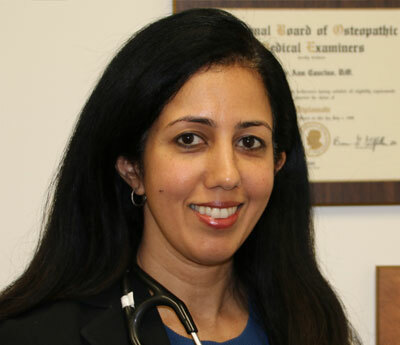 Dr. Jayanti Rao is Board Certified in Allergy and Immunology and Internal Medicine. She received her training in Allergy and Immunology at Brigham and Womens Hospital in Boston, Massachusetts. In addition to her clinical work, her research entailed the cellular mechanisms in the pathophysiology of asthma. She is well versed in a wide array of allergic and immunological conditions, such as angioedema, urticaria, respiratory and food allergies, and asthma. Dr. Shah completed her fellowship training in Allergy, Asthma and Immunology at the University of North Carolina in Chapel Hill, NC. Following fellowship, she remained as an assistant professor in the department of Allergy and Immunology seeing patients in the outpatient clinic and inpatient consult service, as well as participating in the teaching of students, residents and fellows. 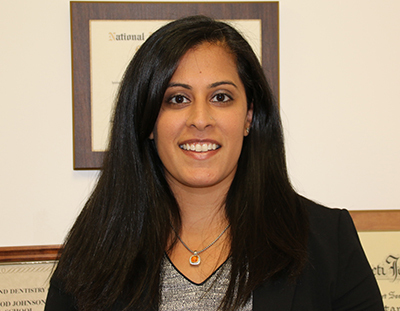 In 2016, Dr. Shah returned to New Jersey to join Princeton Allergy and Asthma Associates. Dr. Shah is well versed in a wide array of adult and pediatric allergic and immunological conditions, including asthma, allergic rhinitis, acute and chronic sinusitis, food allergies, immune deficiency, urticarial, and angioedema.